Kaitlyn Riley grew up on a dairy farm in Gays Mills, WI and regularly showed cattle at local fairs and even the Wisconsin State Fair. From a young age, Riley recognized the incredible work ethic of Wisconsin farmers and fell in love the agriculture industry. 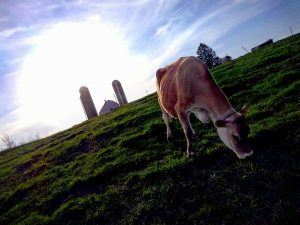 When she moved from the dairy farm to the University of Wisconsin-Madison campus to attend college, she naturally found herself continuing to talk about the cows she had left behind at home. This love of agriculture and communications eventually led Riley to graduate from UW-Madison in 2014 with a degree in journalism — and set the stage for her to continue her passion for Wisconsin agriculture as the 2018 Alice in Dairyland. Riley began her year-long journey traveling Wisconsin as Alice last month in June, which ironically is also National Dairy Month. Her first week as Alice took her from a Timber Rattlers game in Appleton, to Breakfast in the Valley in Eau Claire, in a matter of hours. This set the tone for her extremely busy year ahead promoting Wisconsin’s 43.4-billion-dollar dairy industry and its fellow agricultural trades. 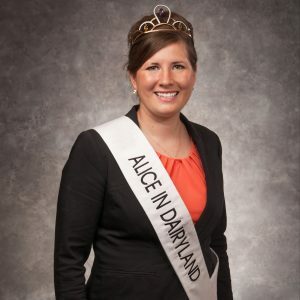 As Alice in Dairyland, Riley is utilizing a variety of the skills she learned as a student in the School of Journalism and Mass Communication at UW-Madison. Riley double-tracked, focusing in both broadcast journalism and strategic communications, and she credits this double-focus to part of her success as Alice. Meanwhile, Riley believes that SJMC professor, Karyn Riddle, helped instill the marketing skills she uses today. Riley even admitted going back to look at a marketing campaign from the class, where she came up with a campaign advertising Reebok shoes, when she went through the Alice in Dairyland interview process to recall past ideas. 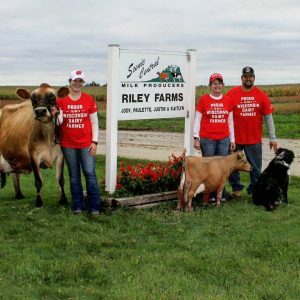 From maintaining a variety of social media accounts, to writing blog posts, creating press releases and participating in interviews with the media, Riley’s role as Alice is a culmination of the abilities from her time at UW-Madison, as well as the dairy farm she grew up on. Only into her second month as Alice, Riley has found her footing. As she travels Wisconsin meeting with people of all different agricultural backgrounds, learning what they do and sharing their stories with the world, she is simultaneously living the dream of the little girl who grew up on a dairy farm raising jersey cows. When asked about her feelings towards the incredibly hectic year ahead as the 2018 Alice in Dairyland, Riley is optimistic.